Nidri, also sometimes spelt Nydri, is the businest tourist destination on Lefkada island. Despite this it is still only a village, and keeps a lot of its village character. It is possible to walk from one end of Nidri to the other in not much more than 20 minutes. At first sight Nidri looks a bit untidy and poorly planned. It is certainly not an architect-designed tourist resort full of authentic character and charm. Many of the buildings along the main street are badly matched, pooly finished – and some are just ugly! The pavements are uneven, and impossible for disabled people to use. Nidri will never win any beauty competitions! But give it time and you will see why almost everyone you speak to comes back to Nidri year after year. The locals are very friendly and work hard to keep their guests happy. Nidri’s numerous bars and restaurants are generally excellent, catering to every taste, and there is a very good choice of hotels and apartments on offer.. And finally (see the photo at the top of this page) Nidri occupies one of the most stunning locations of any place you will ever visit. Everything is within easy reach; towering forested mountains, waterfalls, beaches and the crystal clear Ionian Sea. One of Nidri’s great advantages is its location. Half way down the East coast of Lefkas island it is only 20 km from Lefkada Town in the North, and 20 km from Vassiliki in the South. 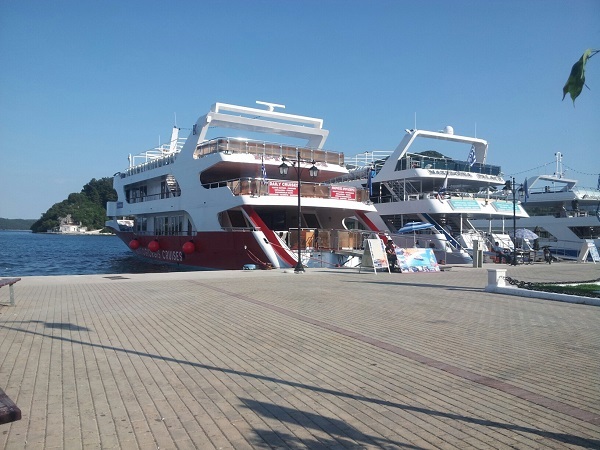 With its good connections Nidri is an easy journey from Preveza airport, Igoumenitsa ferry port and Athens on the mainland. From the islands of Ithaka and Keffalonia, to the South of Lefkas island, it is a short ferry crossing to Vassiliki and then 20 minutes by car to Nidri. One of the cheapest and easiest day tips fron Nidri is to take the ferry to Meganisi island, Lefkada’s little neighbour. Only 20 minutes of spectacular scenery, sailing right beside the legendary island of Skorpios, takes you to this pretty and uncrowded island. Read more about Meganisi on another page. Nidri’s geographical location is superb. Behind, sheltering Nidri from the west wind, is an amphitheatre of hills and mountains covered in olive groves and pine forest. 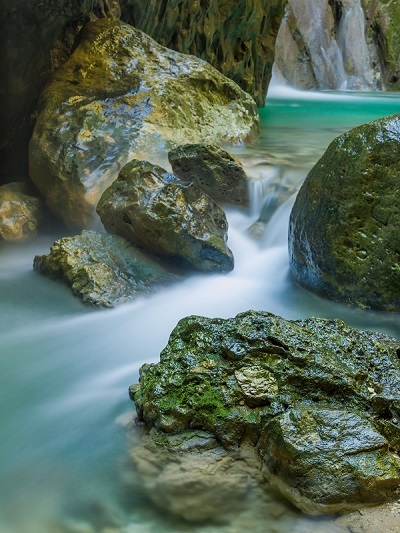 These supply the water for Nidri’s unique Rahi Waterfall – a cool oasis even in the heat of August. To the East of Nidri, stretching to the mountains of the Greek mainland, is the amazing Bay of Nidri (see photo above). Sheltered from the open sea the Bay of Nidri is like a large lake. This allows one of the best activities you will ever take part in – open-sea motorboat rental. Totally safe for everyone, don’t miss the chance to rent a motorboat and explore the amazing islands and beaches in the area. Islands such as Skorpios, home of the famous Onassis family, and the private island Madouri with its distinctive house. You can look – but don’t touch! You are allowed to sail around them but you are not allowed to land. Nidri is also a magnet for yachts, so there is always something to see and do. More activities, such as cycling and walking, later on this page! 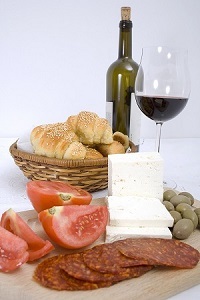 Nidri has probably the widest choice of restaurants and bars on the whole of Lefkas. Whatever your choice of food; Greek, Italian, Chinese or Indian – you will probably find it here. You will find English breakfasts, burger bars and crepperies if that is your taste. But nothing smells and tastes as good as a tradition Greek ‘Fistaria’ (grill house) serving delicious fresh souvlaki (skewers of meat cooked over chrcoal) served with a Greek salad and a cold bottle of local wine. Treat yourself to a special night out and take a taxi up into the hills to one of the fantastic family run tavernas in the villages. Well recommended is Dimitris in Paleokatouna (10 minutes by taxi from Nidri, approximately 7 Euros each way), and the taverna in the village square of Haradiatika (15 minutes, between 10 & 15 Euros each way). Check the fare with the driver first. There is also a wide variety of bars in Nidri. Many, but not all, are along the waterfront and in the harbour. They are open until late but music is turned down at midnight. There is one nightclub on the beach at the North side of Nidri called the ‘Sail Inn’. They have some great parties! 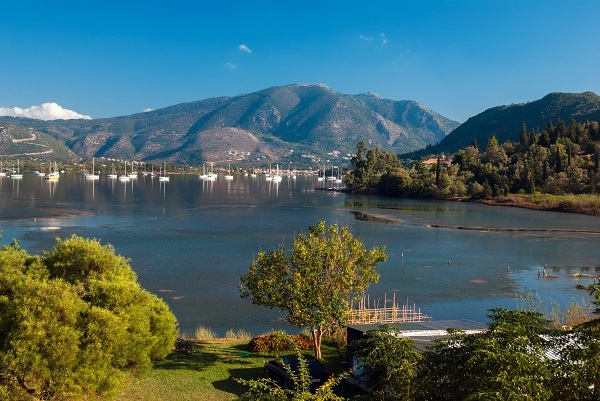 Along with Lefkada Town, Nidri is one of the main yachting destinations in the Ionian Sea Nidri is the starting point for several flotillas and bareboat yacht charter companies. Its location on the East Coast of Lefkas means that the sea is usually calm, and Nidri is an ideal place to learn to sail. Combined with an interesting coastline full of sheltered and secluded bays, and several Islands offshore such as Skorpios (the private Onassis Island), there’s plenty to see. All of this can also be enjoyed on one of the local boat trips which run throughout the summer – ideal for those that can’t bring their own boat! Or rent a motorboat or speedboat in Nidri while you are here and explore by yourself. One other great way of spending a day at sea, sailing with the wind, is to charter a sailing boat for a day with a private skipper to do the sailing for you. All you have to do is relax and enjoy the sun, but if you are feeling more active you are welcome to help sail the dinghy! This is available in Nidri and is the perfect way to celebrate a birthday or anniversary, or as a treat. But book in advance as this is a very popular day out! 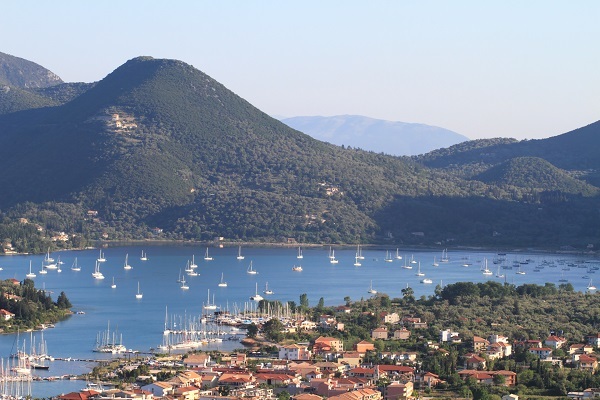 Nidri is also the assembly point for the annual Ionian Regatta – one of the biggest Yachting events in the Mediterranean. Usually held on the third Thursday of September, it typically attracts about 190 entries and is a spectacular sight to watch. Many of the daily boat trips in Nidri offer a good day out to follow the event, but they are popular and it is best book in advance. There are so many boat trips available in Nidri that it is possible to take a boat trip every day of your holiday and still not have tried them all! The same as with yachting and motorboats, Nidri is perfect for boat trips. The sea in the Bay of Nidri is calm, so even those who get sea sick should not have a problem as long as they stay local. This includes the shorter half day trips around Skorpios as far as Meganisi, as well as the full day ‘beach barbeque’ boat trips that operate locally such as the Odysseus (the Greek galleon that looks a bit like a pirate ship). The larger boats in Nidri harbour offer much longet trips which head out to sea visiting destinations such as Kastos, Kalamos, Ithaka, Kefalonia and the West coast of Lefkada. It is a good idea to go down to the harbour in the evening to inspect the different boats, take a look around them if you like, and check the itinerary. Nidri beach is on the north side of the village. Awarded a ‘Blue Flag’, it consists of gently shelving sand, shingle and pebble. There are several beach front bars and restaurants. It is quite narrow and can become quite busy at the harbour end of the beach during July and August. The solution is to simply walk north along the beach for 5 minutes and it becomes much quieter. If you want to get a bit further from the crowds you could consider hiring a bicycle to find other nice beaches not too far away. About 4 km North from Nidri is a beautiful long beach. It is about 500 metres after the harbour in Perigialli, below the main road, just before the road starts to climg. Alternatively take a cycle to Desimi Bay, a beautiful bay on the other side of the Geni peninsula. It is fainly flat except to the last 1 km. The immediate area around Nidri village on Lefkas is fairly flat and is good for gentle cycle rides and walks through the olive groves. Try a walk to the waterfalls near Rahi village (approx. 4km), or cycle around Vlicho Bay to the little white church of Agia Kiriaki on the headland of Geni (Yeni). Although the white church is opposite Nidri and only a few hundred metres by sea, the journey is approximately 8km by land. Simple mountain bikes can be rented all over the village for between 5 and 10 Euros per day including a lock. For those with more energy there are walks into the surrounding hills to Paleokatouna, Neohori and Haradiatika; and in spring the flowers and blossoms are beautiful. Nidri has one bank, four cash machines (ATM’s), and several exchange bureaux. The bank can become extremely busy as it is only open for restricted hours, and all the local traders are trying to deposit money. Their exchange rate is usually no better than the exchange bureau, so it is probably better to avoid the bank for exchanging your currency. During the summer season, dozens of minimarkets are open all day from 9.00am until about midnight. 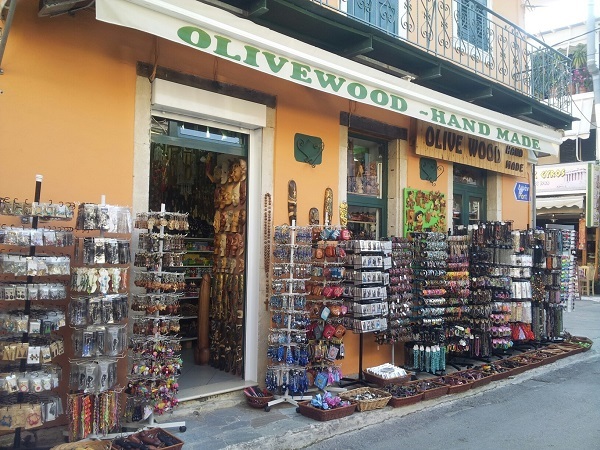 There are also many gift and souvenir shops which are open until late at night. There are three chemists in Nidri, and an emergency chemist is usually open somewhere in the area during nights and holidays (there will be a notice in all chemist windows to tell you where the emergency chemist is). Two doctor’s surgeries are open every day, and there is a Post Office open weekday mornings. The nearest hospital with emergency medical facilities is at Lefkada Town.